Mariana Castillo Deball works at the intersection of fields such as archeology, literature and the sciences, appropriating methodologies and practices common to these areas. She also often establishes partnerships with professionals and institutions from different disciplines to develop her works, promoting convergencies peculiar to the visual arts. Her installations, publications, and performances construct objects and narratives for breaking down the categorical barriers and bringing science and fiction closer together. For the 32nd Bienal, the artist partnered with the Geosciences Institute of the University of São Paulo and the Araripe Geopark in Ceará State, Brazil, to build the installation Hipótese de uma árvore [Hypothesis of a Tree] (2016), which consists of a spiral-shaped bamboo structure that refers to a structure for the evolutionary representation of species. 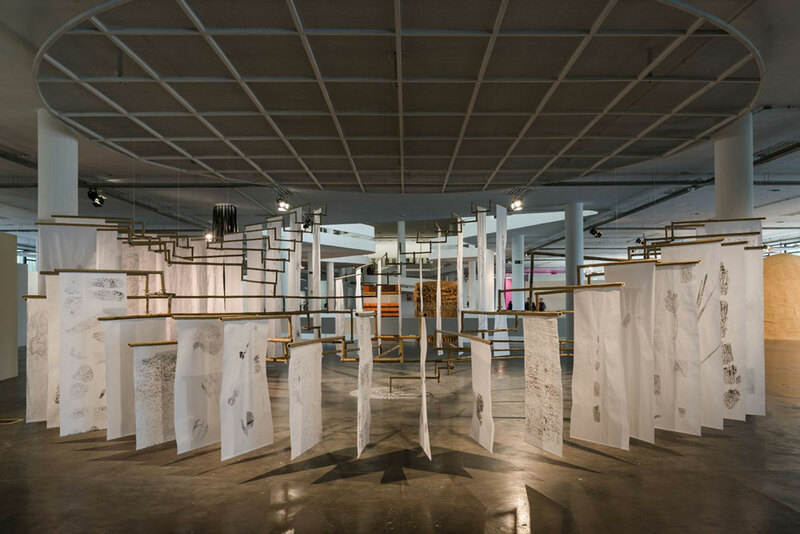 The work contains dozens of frottages, a transfer technique widely used in paleontology, performed by the artist on Japanese paper, of fossil and geological materials found in archaeological sites, institutional collections, and building facades in the city of São Paulo. By spirally juxtaposing the records of different elements from different time periods, Deball puts ideas of evolution, extinction and history into perspective.